Spray 2 mini muffin tins (with 12 cups each) with cooking spray. 1. Preheat the oven to 350 degrees F. In a medium skillet, brown the turkey sausage links on medium-high heat. Cook until sausage is brown all the way through. Cut sausage into 1/2 inch pieces. Set aside. 2. In a large mixing bowl, whisk together egg whites and eggs. Whisk in skim milk and season with salt and pepper, to taste. Stir in the chopped spinach. 3. Grease 6 muffin tin cups with cooking spray or line cups with paper liners. Pour egg mixture evenly into the muffin cups. 4. Distribute cheese and sausage equally between each muffin cup. 5. 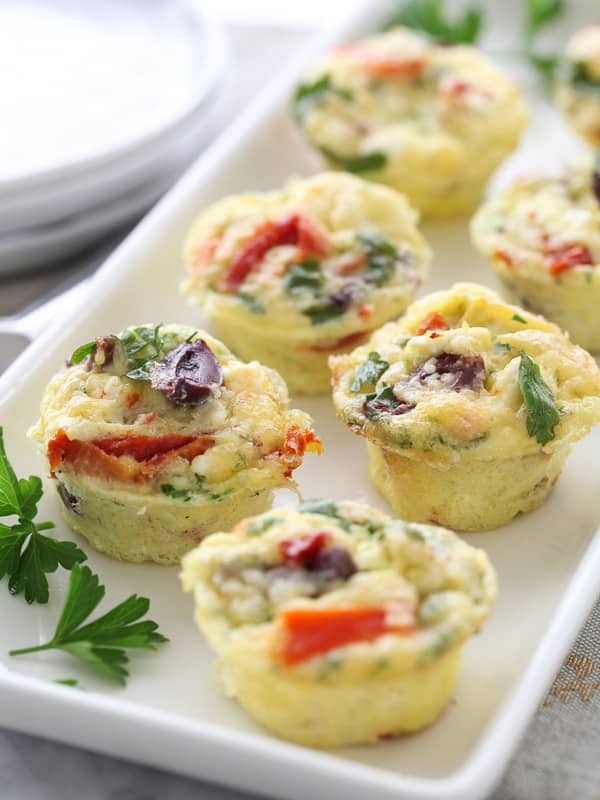 Bake egg muffins for 20 minutes, or until the muffins are firm in the center. Remove from oven and gently go round each egg with a butter knife. Serve warm. Preheat oven to 375 degrees F. Spray a muffin tin with cooking spray or line with muffin liners. Add the black beans to a large bowl. Lightly pat the beans with a paper towel to absorb any excess moisture. Add the avocado, corn, bacon, and cheese to the bowl. Lightly stir to combine. Use a spoon to divide the corn mixture evenly in the muffin tin. In a large bowl, add the eggs, milk, hot sauce, salt, and pepper. Whisk until well combined. Optional: transfer the egg mixture to a large measuring cup for easy pouring. Pour the egg mixture over the corn mixture in the muffin tin, filling it until each cup is almost full. Bake for 20 minutes. Cool for at least 5 minutes before serving. Optional: Top with sour cream, and salsa. Preheat oven to 375 degrees F, and grease up a standard 12-cup muffin tin. Serve with extra salsa and chopped avocado.